You Make A Difference With Each Gift To Support The FFBI In Your Community. Firefighters Burn Institute was founded, and continues to be led, by firefighters wanting to make a difference by serving their extended community. 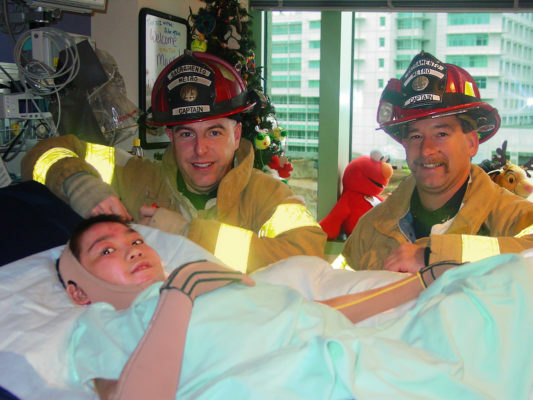 Our programs go far beyond just coming to the aid of burn-injured firefighters. FFBI’s range of services encompass the entire burn community and the medical professionals who treat them. Our annual Firefighters Kids Camp and Little Heroes Preschool Camp, along with the Adult Retreat, make a difference in the lives of survivors, their families and their peers as they overcome the physical and emotional challenges associated with burn recovery. These programs are largely staffed and supported by the same rescue personnel that might have responded to their call! In recent years, the FFBI has broadened its scope to address the very specific and unique experience of burn injured firefighters, through its Firefighter Response Team, providing support to the families of those firefighters admitted to our Regional Burn Center, and a Firefighter Peer Support Group. The Firefighters Burn Institute is eternally grateful for the continued help and support we have received from the community over the years. We are very proud of the positive role we play in improving the lives of burn survivors. Our mission is not possible without you. Please consider making a tax-deductible gift today to help us continue bringing our special brand of Good to the world.